Tomorrow is my due date. 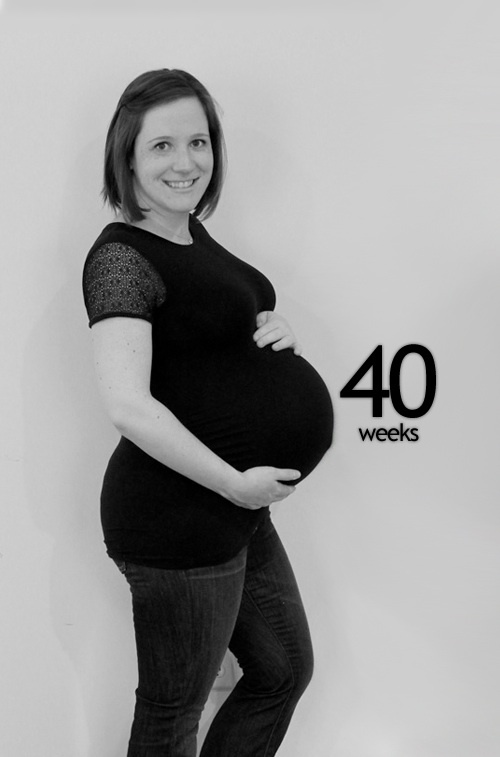 I honestly had no desire to take a 40 week picture . I haven’t worn jeans in 2 weeks and I’m trying to grow out my hair, so it’s in an awkward flipping stage. Therefore looking decent these days = extremely time consuming. I took this picture right after a nap and said eff it, I’m not straightening that weird flip in my hair that just never goes away. Another funny story, we usually a take a bunch of these pictures but this time, we only took like 5. That’s why my arms are in a different position because I completely forgot how I normally pose. The important part is that my head is included in the picture, right? In my last picture post I said that I couldn’t imagine what a 40 week picture would look like. Holy protruding belly! Mike and I were laughing that I thought I was huge at 25 weeks, clearly I didn’t know what huge was. We’re so close to being done with the nursery and I have so much I haven’t yet blogged about. I think I just need another day to organize then I can sit down and write some posts about everything we’ve done in the past week or so! I think it’s safe to say, we’re feeling pretty ready at this point. Thank you for not coming early baby, these past 2 weeks have been so very necessary for my sanity. But come soon, okay? Yay! You look great, good luck! You look beautiful as usual 🙂 Too funny about thinking you were “huge” at 25 weeks! Hoping you have a great delivery, and soon! Can’t wait to see Lil House baby pictures! Can’t wait to see him/her. My husband and I have a wager on what your having. We have four boys. Good luck! You look great! Can’t wait to know the gender. I hope you have a nice and safe delivery! It’s a girl. Fo sho. lovers but this post is truly a pleasant paragraph, keep it up. for all employees and their family. I must admit it was a golden ‘silver’ minute even though I knew that my silver sack was nothing but a panacea, real or imagined, for my distressed emotions following the accident. the Mac way of life.